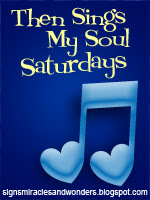 I'm joining Amy at Signs, Miracles and Wonders since it's another "Then Sings My Soul Saturday". It's a great day to listen to great worship music. You can link to Amy and find other participating blogs. Tomorrow is Resurrection Day or Easter Sunday. As a Christian, it's a day of celebration. Jesus didn't stay in the grave. And because He lives ...I can face tomorrow. What more do we need than to know our Savior lives?! I grew up singing this song. Hallelujah -- BECAUSE HE LIVES we can face tomorrow! I would like to sing to you HAPPY EASTER! Hello Debbie, Wonderful post-thank you for sharing. I also love the song and it moves me to tears when I sing it. Blessings to you and yours this Easter. This says it all, my friend! May you have a blessed Easter, sweet sis! So glad to know you! The Gaithers - one of the best - thank you for posting this! Love it and the message the song gives. This is a favorite song and I enjoy Gaither Vocal Band. For my Easter week posts I've included a couple songs on YouTube. A blessed Easter Morning to you and your family. Nice song, but new to me. It's timely to get ones' horizon broadened at Easter time. Thanks for that beautiful version of their wonderful song. Happy Easter! What a beautiful blast from my childhood and one I still sing. Praise the Lord dear sister. I pray the day is as wonderful for you as it is for me. JESUS IS ALIVE AND BECAUSE HE IS ALIVE WE TOO ARE ALIVE IN HIM! GLORY!!!! Yes, it is in Christ's ressurection that we are reminded time and time again that the two things over which we have no power-sin and death- are not invincible powers. Happy Easter, Ms. Debbie and to your family:) Alleluia! Happy Easter. I pray you are feeling better. Hugs. Hope your celebration of the Risen Lord has been abundantly blessed Debbie! Amen to that, Debbie. Yes, He is alive!!! I hope you had a very blessed Easter, my friend. Because He Lives....one of my favorite songs...Because he lives we can face today and tomorrow. The song is always a blessing. And you my dear friend, are always a blessing.